Matches between Shooting Stars Sports Club and Enyimba International FC always come classic. The both sides are powerhouses in their respective zone; consider their rich history and amount of followership they command. Its will always be two traditional sides locking horns. The host, in the reverses fixtures, shared the spoils with the Aba giants in their makeshift abode, Calabar. This brings a more interesting perspective to this, knowing that Gbenga Ogunbote will lead Enyimba against his former employers to at least share the spoils. There’s also the impression of contrasting fortunes; while Enyimba are on the road for points to ask for a place in the continent next season, 3SC eager to take the maximum home points to push for their presence in Nigeria’s top flight nest season. After an impressive time with Jos based Giwa FC, Abdullahi found his way to Minna to tutor Niger Tornadoes and ushered them into the Nigeria Professional Football League (NPFL). His romance with Ikon Allah Boys did not last till the end of that season before he parted ways with the club. In this fixture, he will be against his former side, as the man in charge of Abia Warriors. In the revers fixture – in Umahia, the game went in favour of Abia Warriors and Biffo claimed the victory wasn't a surprise since he knew the ability of some of his former wards. He shouldn't expect an easy task in Lojoka this time around. Reports have it that the Management, Technical and Coaching staff of Port Harcourt based side, Rivers United have been handed a 3-match ultimatum by the Permanent Secretary of the ministry in charge of sports. This decision came after a stakeholders’ meeting was concluded in order to reposition the ailing club. It is obvious that Rivers United had one of the best pre-season preparations, which included a tour to Spanish capital, Madrid and a refresher course for Stanley Eguma. Yet, all the support have yielding so little that Rivers United had a shabby outing on the continent and are in difficult times in the NPFL. A lot has been said about Lobi Stars front man, Anthony Okpotu and how he has grown to become Lobi Stars’ all-time highest goal scorer. This is the result of hard work and being consistent. Okpotu’s 14 goals this season has put him up against Stephen Odey – 17 goals, this season as the duo race for the goal poacher’s award. With two historic hat tricks this season and scoring 4 goals in four matches, the attacker has shown class and excellence in the discharge of his duty. For the fact that the list created so much controversy, there will be more attention on the lads who made Salisu Yusuf’s list for the home-based Eagles. They will have to put in work to justify their call-up and hope that they get the affirmation of pundits and league followers alike. 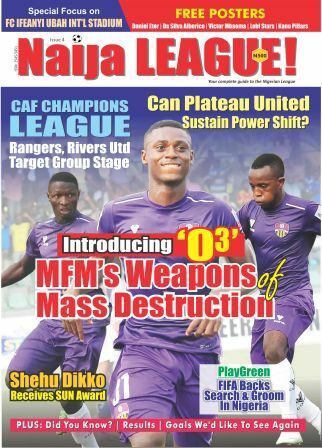 Plateau United keep scraping out results, but having it difficult on the road. At the end of the day, the result in Makurdi when Lobi Stars host Plateau will not change the appearance of the summit of the league table. United will still have the lead on the log even if they leave Makurdi empty handed.